Over the years, gillnets have been increasingly considered a predator of the sea. They pose a serious threat to many marine animals such as fish, sharks, dolphins, turtles, and even manatees, who can become entangled within them. 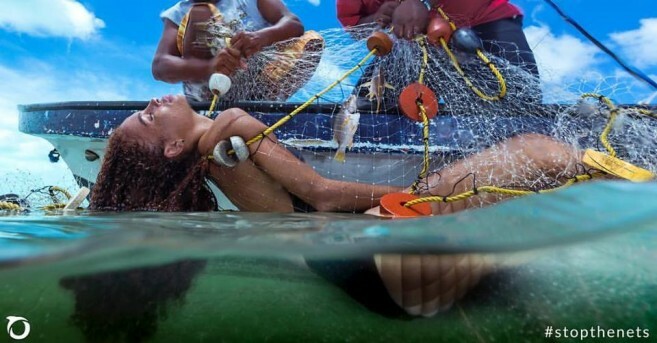 In an effort to ban the continuous use of gillnets and promote sustainable fishing gear/equipment, Oceana Belize has launched a social media photo project titled, “Are We Drowning Our Future”, to portray the indiscriminate nature of gillnetting, as well as to highlight the negative impacts it has within the country. 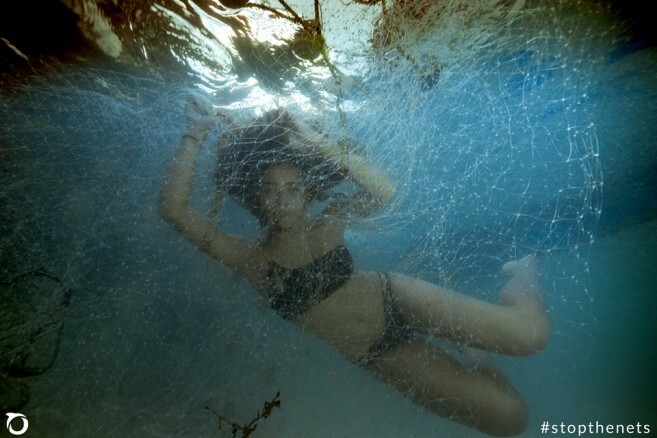 The set of four photographs were taken in San Pedro, Ambergris Caye by Oceana’s Alex Ellis. Ambergris Caye is Belize’s number one tourism destination, and is known for recreational fishing. 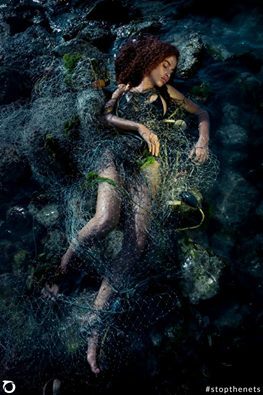 The photos feature models Joyjah Estrada and Emaun Hyde entangled in a gillnet to demonstrate how in the same way, protected marine can be trapped in this harmful gear. “The photoshoot was fun, but also challenging. You could see how easy it would be to become entangled in a gillnet. It’s sad to think that things like that are happening to our marine life, and to creatures that are far more valuable alive than dead.” said Estrada. For Hyde, taking part in this project was a labor of love. “We really don’t realize how lucky we are to live in Belize because of just how blessed Belize is. But it won’t always be that way if we don’t take action today to help safeguard our resources for own benefits and gains tomorrow”, said Hyde. Not only do gillnets negatively impact our marine species, but they also affect the livelihoods of many Belizeans who depend on tourism for employment, and fishing for food. According to Oceana, gillnets compromise the health of commercial fish stocks, the abundance of protected and/or endangered species, and the economic benefits of both commercial and recreational fisheries, which threatens the overall health of the reef system. “Nets can't tell the difference between a fish, manatee, turtle or dolphin. They continue to damage reef habitats and drown these protected, charismatic and keystone species. As a country that depends highly on tourism, the continued use of gillnets is drowning our ability to rely on the sea to provide us with food, jobs and cultural identity. We are literally drowning our future,” said Estrada. The Belize Fisheries Department states that only 169 Belizeans are licensed to use a gillnet. Even so, the bulk of gillnets being used in local waters belong to unlicensed foreign fishermen using unregulated gear. Sport fishing, which credits to more than $200 million per year, is one of the main industries that is under threat of gillnets because of neighboring Guatemalan and Honduran fishermen operating illegally in Belizean waters. Currently, there is a proposal that would announce a phase-out of the gear, and it would give the 169 licensed fishermen two years to transition to more sustainable equipment. Oceana, among other organizations and individuals from the fishing, tourism and business sectors are in full support of the proposal. For 15 years, Oceana has been the largest international advocacy organization focused solely on ocean conservation. This social media campaign also complements a documentary produced by Oceana, “Net Loss: Are We Drowning our Future?’ The video contains fishermen from across Belize discussing the tragic reality that will emerge if Belizeans don’t take proactive steps towards sustainability. Oceana will continue to spread public awareness until gillnets are banned. Their dedication has led them to embark in another upcoming project that emphasizes the devastating effects that unsustainable fishing gear has on the shark and fish stock in Belize. For more information and to view the photographs please visit the campaign website at http://belize.oceana.org/blog/are-we-drowning-our-future.